one-on-one time Archives | How Do You Do It? My birthday is 6 days after that of my twin daughters. Both usually fall in the same week as American Mothers’ Day. In the widest conceivable stretch, all three events occur within a 9-day period. We’re nothing if not efficient. 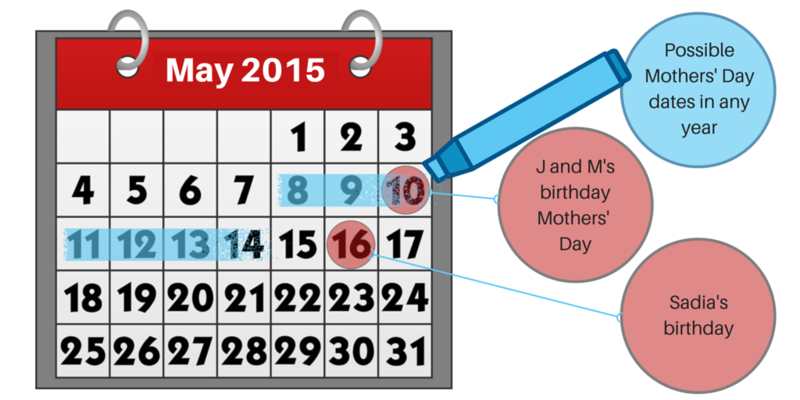 This year, Mothers’ Day fell on M and J’s birthday. My birthday was the following Saturday, the day before yesterday. On Thursday evening, M informed me that she wanted to take me out for a birthday/Mothers’ Day treat. Her grandparents had given her a Starbucks gift card for her birthday and she wanted to spend it on me. This is probably not what they had in mind, but I have the world’s sweetest kids. 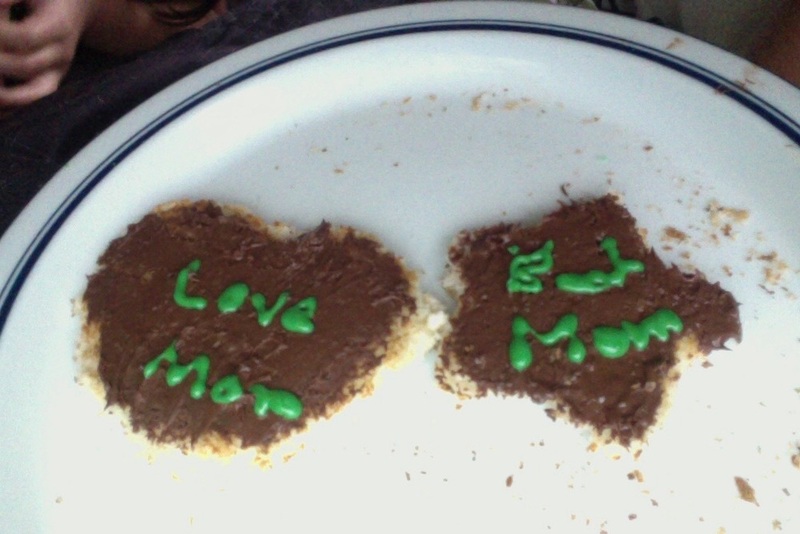 Toast, cut into shapes, spread with Nutella, with “Love Mom” and “Best Mom” inscribed in royal icing. Seriously, sweetest kids ever. M was insistent that our Starbucks celebration be exclusively ours. Her sister was not invited. I told her that I’d arrange a solo playdate for J so that she and I could have our mommy-daughter date. We happened to be leaving an after-school school-sponsored event when we had this conversation, so I decided to see whether I could locate my girls’ best friend’s family, whom we’d just seen. They were still there. I asked whether they’d be willing to have J over. They said that they could make it happen the very next day. M and I had a lovely time. 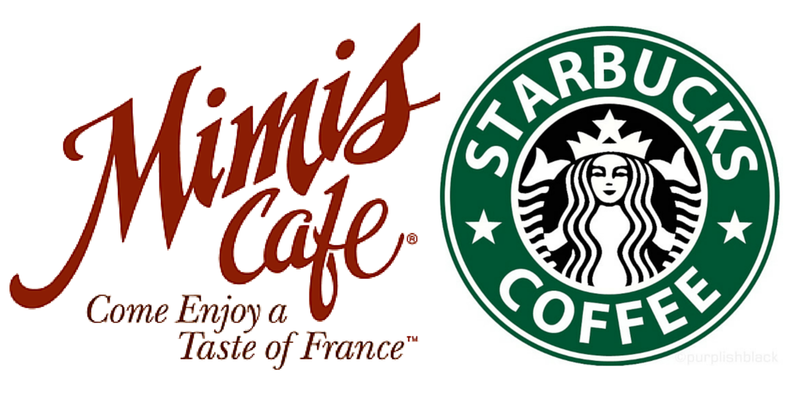 I took her out for dinner at Mimi’s Café and then we headed to Starbucks for dessert on her dime. She got a chocolate milk and brownie. I got a decaf soy java Frappucino and cookie. We talked the entire time, about her friends, what she’s been reading, the state of the dwarf planet Pluto, what I’ve been doing at work, and the importance of feathers in art. Age nine feels like a watershed between little girlhood and tweendom. I was not allowed her to kiss her in public, but M did want to sit in my lap. I was not allowed to take photos, but she took my arm everywhere we went. She told both the waitress and the barrista all that we were celebrating. She didn’t mention her sister to either of them, which was a first. I loved this one-on-one time, in no small part because I knew that J was having an equally good time. It also helped that there wasn’t any time pressure on us to retrieve her. Both my daughters (and their friend) would get tired around the same time, so we would very naturally ending up picking J up in time for bed. We’re planning a mommy-daughter date for me and J in the near future. M will head off for a playdate with a different friend. Making quality one-on-one time is a challenge for any parent with more than one child, but it’s all the more challenging for a single parent of multiples. If you’ve ever wondered how you can help the single parent in your life, how about offering to watch one or both children? Don’t be offended if he or she doesn’t take you up on it right away, or ever. It really is the thought that counts. I’d never been one to think of my birthday as anything but another day of the year, but this year, my girls made it truly special. Today, my daughter M and I went to her very own doctor, the one she doesn’t share with her sister. M’s twin sister, J, did not join us, instead staying at school with their 3rd grade class. This is quite the rare occurrence, since I usually try to schedule appointments outside school hours and therefore have both girls with me. M was very silly at the appointment, needing more reminders than usual to focus on the doctors’ questions. I wondered what was going on, only to discover this was yet another sister thing. M: I was super extra goofy for you at the doctor. M: You weren’t there, so I did your sillies for you. M: You weren’t there, so I had my own sillies and then I was extra silly to make up for you. J: Yeah, I got that, and I repeat: “WHAT! ?” That makes no sense. At least she agrees with me. M missed her sister. The appointment ran late enough that M risked missing lunch at school, so I took her to a restaurant for a meal. When I asked for a table for two, M let me know that it sounded wrong. She went through every combination of meal partners she could think of, pointing out that we always needed at least 3 seats. By the time we were done eating, though, she was enjoying herself. My children, as are your’s, are growing up too fast. We are very near to being “one and a half,” which is practically ancient in baby years. So many milestones have come and gone…breastfeeding, weaning, first solids, nap schedules, sleeping through the night for the first time, switching carseats, walking, teething, first haircuts, first words…so very many firsts. My babies aren’t really babies anymore. I was struck by this realization as I picked up my son from his crib last night. He has been sick with a fever the past two days, and I wanted to make sure he was okay before I went to bed. He is so heavy and the mattress is as the lowest setting, so it was very hard to lift his 27lb sleeping body out of the crib, while on my tip-toes in the dark. I settled into the rocker, and he snuggled up against me, skin hot too the touch, breathing quietly, his little arm wrapped around my neck. We sat like that for almost half of an hour, him sleeping, me rocking. Eventually, my arms started to get tired, and I realized that I need to get a bigger lap! His little legs were hanging off of my lap, and we barely fit in the embrace that we both know so well. Yes, he is a pretty big little boy, but it struck me that I will never know ahead of time when my last time rocking him like this will be. It will just happen. The key for me, is to have one-on-one time with my children. When they are together, it is loud, messy and my job as referee and nurse does not exactly leave me feeling warm and fuzzy toward my children. But running errands? With one kid? I am not kidding when I say it is truly delightful! Yesterday I took my daughter to the post office with me. And since it was just the two of us, I let her walk. Oh! The joy emanating from that little body! She was so happy to walk along side Mama, and because it was just the two of us, I had all the time, patience and energy in the world to focus on my little love. I was able to watch her interact with another little girl, with out worrying about what her brother was doing to unpaid for merchandise. I didn’t worry about losing her, about a tantrum, and I didn’t get impatient with her when she picked up a discarded wrapper from the floor. To outsiders, it was just a quick errand. To me, it was an opportunity to delight in my little girl, to learn about her, to focus on her, to bond. Faith running errands with Mama. Last week I left Faith at home with her grandma and took Jonathan to the pediatricians. He too was treated to the hand-holding-walking, rather than the stroller, which he loved. It was a pleasant visit to the doctor’s, no screaming, no tears, no stress. After that chore was complete, we went out to lunch, just me and my little buddy. He drank milk from a straw, and helped me clean up when we were done eating. We walked out, hand in hand, he was ready for a nap, and I was feeling so grateful that I got to spend the afternoon with him, at an age where he still adores me. Twins seem to have a type of synergy. Together, they are a sum greater than just two babies/toddlers/children. They are a force to be reconned with. Some days, I don’t handle that stress too well. I become unhinged, get irritated and angry. I know that everyone has bad days, but I hate admitting that I do too. It makes me feel badly that I don’t feel recognize and remember the significance of these years at all times. That is why I love to experience my children as individuals. I think that it will become a tradition in our family that each child will have one-on-one time with Mama and Daddy every week. Are you delighting in your children? 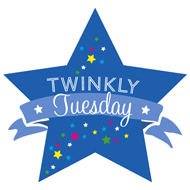 How do you find time or make ways to see your children as individuals rather than multiples? Are you a practical or sentimental mom? What are you currently feeling guilty about regarding this journey called parenting?